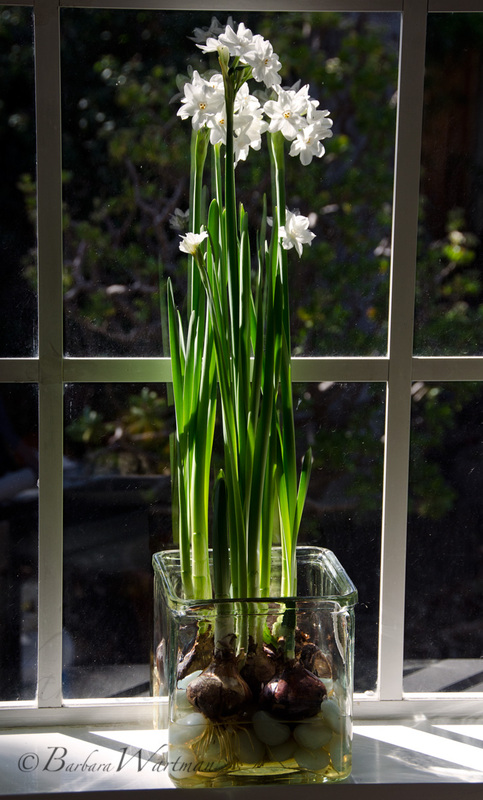 Last week’s post was about using a solution of alcohol and water (one part alcohol to 10 parts water) to restrict the growth of paperwhites. Theoretically this will keep the stems short and strong enough to support the flowers without them tipping over. My paperwhites have grown super fast this week. And some of them have started tipping over. I think this is because I didn’t change the water soon enough. The instructions were to start the bulbs in regular water and when the shoots reached a couple of inches to pour out the plain water and replace it with the alcohol/water solution. By the time I read about this and replaced the water most of the bulb shoots were 3 – 4 inches high, too far along apparently to have the desired effect. It will be interesting to see if the bulbs with the shorter shoots do any better. Enjoyed this post, did not know about alcohol being used as slow growth agent. I found 3 places with daffodils in bloom on Saturday in Wilmington, NC could these be paper whites? BTW we have bees also. Pretty photo, delaying the start of my paper whites a bit this year so I can have them through Christmas and a bit after! Thanks, Stacy. I was just thinking that I might splurge and get few more bulbs to have for Christmas. I still don’t like the fragrance, but gosh they sure light up the room!